VW's supervisory board gave CEO Martin Winterkorn a 5-year contract extension in January. Winterkorn earned 9.33 million euros ($12.9 million) in fixed salary, bonuses and profit incentives compared with 6.6 million euros a year earlier, VW said in its annual report. Compensation growth stemmed partly from a new long-term incentive plan introduced in 2010. Winterkorn's pay beats the earnings of Daimler AG CEO Dieter Zetsche and BMW AG CEO Norbert Reithofer. Zetsche earned 8.69 million euros last year. Reithofer's pay and bonuses increased by 66 percent to 4.3 million euros. Winterkorn is one of the best-paid executives among companies on Germany's benchmark DAX Index. Deutsche Bank AG CEO Josef Ackermann was paid 9.55 million euros in 2009. Siemens AG, Europe's biggest engineering company, paid CEO Peter Loescher almost 9 million euros for the year through Sept. 30. Deutsche Post AG, the region's largest postal service, said today that CEO Frank Appel's compensation in 2010 totaled 2.96 million euros. Volkswagen's earnings before interest and taxes last year almost quadrupled to a record 7.14 billion euros. The manufacturer is proposing a 2010 dividend of 2.20 euros per common share and 2.26 euros per preferred share. 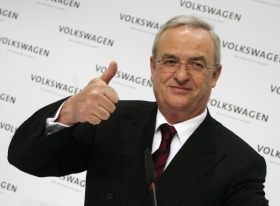 VW's supervisory board extended Winterkorn's contract in January by five years until 2016. Pay for Volkswagen's eight-member management board, which includes CFO Hans Dieter Poetsch and sales chief Christian Klingler, almost doubled to 36.7 million euros from 18.7 million euros. Michael Macht, who joined the board in October, earned 1.03 million euros.